aside	PTSD is a severe and chronic illness having lasting effects – As a survivor of child abuse, domestic and sexual assault Artist Paulissa Kipp talks to ASLI about how she uses her art and how it is important to educate the public about the lasting effects of abuse. Paulissa Kipp, 49, from Omaha, Nebraska, USA. is a multi media artist who is actively bringing awareness for social change. Using line, colour, motion, photography and words to achieve activism for change through her strength of spirit. As well as being a multi media artist she is a Mental Health 1st Responder, Peer Support Specialist, Advocate, Author, Photographer, Speaker and Whole Health Action Management facilitator. With these skills and relentless ambition to make a difference, Paulissa is what ASLI is all about and we were excited to receive her submission as this gave us an opportunity to discuss our campaign “mental illness, health and recovery” with someone actively addressing this important issue through art. Paulissa also facilitates art journaling, zentangle and spoken word workshops to empower participants to dig deep and forge strength through vulnerability. What is your artistic/creative background? I am a self-taught artist. For many years, my primary mediums were literary art and photography. I began painting after being exposed to art journaling in a women’s writing class. What motivated you to deal with your chosen submission subject? As a survivor of child abuse, domestic violence and sexual assault, I believe it is important to educate the public about the lasting effects of abuse. The effects don’t end when the abuse does and PTSD can have a significant effect on quality of life and overall health. I AM FROM abandonment and the land of NEVER ENOUGH. close and play record players and dancing outside. I AM FROM the rainbow pot. I normally have a topic that I want to explore – a feeling or social commentary I wish to make. I begin by sketching out the piece with watercolor pencil or pen, then decide on my color palette and begin painting or drawing. I work intuitively and allow the piece to breathe itself into existence. Who are you influenced by within your artistic discipline? I am greatly influenced by classic artists Rousseau and Picasso. Some contemporary artists who inspire me are Ardith Goodwin, Yanik Falardeau and Christine Cantow. I am inspired by line and riotous color. Who inspires you in general? I am inspired by activists, advocates and artists who use their unique gifts and differences to draw attention to the beauty of each person and to societal issues. What causes and world issues are you passionate about, campaign for, volunteer for…? I am passionate about mental health awareness, domestic violence and sexual assault prevention, LGBTQ acceptance and feminism. 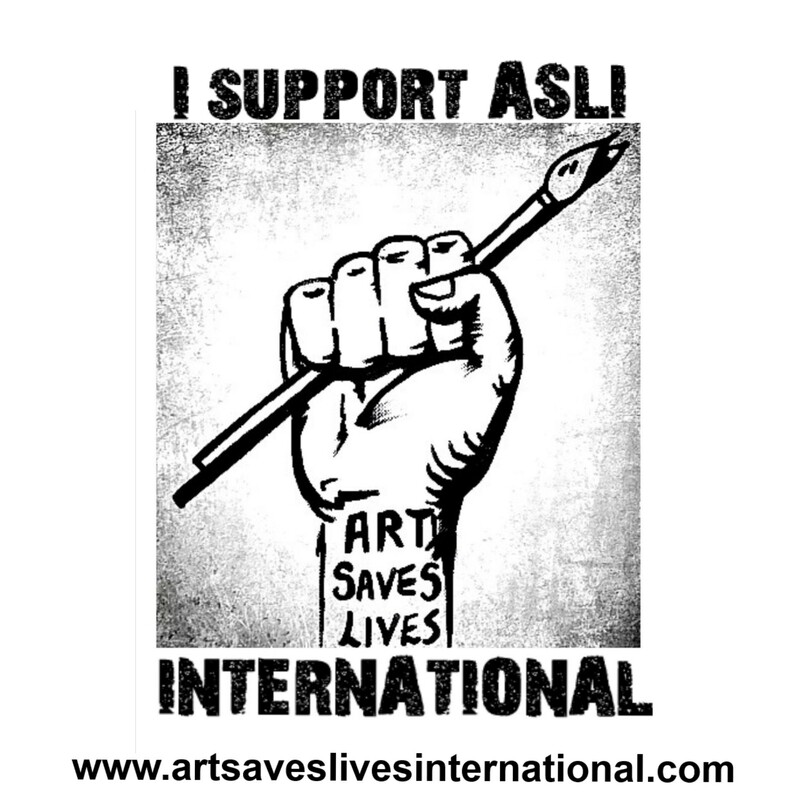 What do the statements “art saves lives” and “art creates change” mean to you? In my opinion, art saves lives means giving people a means of expressing painful things. When we are hurting, words can be hard to find. Art creates change means the ability to both change myself and the world: to add color where shadows live, to create hope, to explore my soul and then share that with the world. It is transformative in its power to calm, energize and invite reflection and growth. Have your artistic and creative outlets saved your life in anyway and do you think your message within them could help create change in the world? My art came into my life during a very dark period. I had several back to back health issues and trying to get diagnosed was a maze of doctors, being given wrong information and not being listened to. Art allowed me to channel that frustration and use the pages to communicate with my doctors and therapist. More recently, I experienced suicidal thoughts after an illness triggered a lot of PTSD anxiety. I brought my journal and some markers to the hospital and journaled through my fears, which lowered my blood pressure and heart rate. I do think my art’s messages have the power to change the world by visually representing concepts that are difficult to understand. What are your present and future goals for your art? I am in the process of transitioning to a full-time healing artist and peer wellness coach. I am seeking ways to collaborate with advocacy groups to offer healing art to trauma survivors. Can you tell us about your own experiences with mental illness? I first began experiencing mental health symptoms in my 20s but it wasn’t until my early 40s that I was diagnosed with PTSD and bipolar disorder. I experience extreme overwhelm and cognitive dissonance. I can be unable to see my way out of the current challenges. I have been suicidal and have learned from that experience just how much I value myself. With my peer support training and a strong support system, as well as my art I am still here. How does your artistic /creative expression help you with your mental health? The ability to express myself with line and color and to just be with the surface and materials has gone from being a coping mechanism to being passionate self care. Art making is a safe, meditative space for me. I have to make art to create space for gratitude, growth and exploration. Have you ever experienced being stigmatised or marginalised due to your mental health or have you seen this happen to someone else? I have experienced mental health stigma many times. I have had people tell me “That was a long time ago. Just move on. Think more positively and the triggers will go away”. The public doesn’t understand that trauma causes responses that are not one and done. I have also had to fight harder to get medical treatment and be listened to as a result, even with a WRAP plan (Wellness Recovery Action Plan) and an advanced directive. Unfortunately, many medical providers are not trauma-informed. They falsely believe that knowing how to deal with medical trauma is the same as being trauma-informed and it is not. The patient with mental health issues requires a far different approach. Have you ever received treatment for mental health and if so, what was it, did it help and was it private or state funded? I have received private therapy with a psychiatrist and psychologist. It has helped in terms of me challenging my thoughts through dialectical behavioural therapy. Medication has helped me to lessen my startle response and to be able to stop my racing thoughts at night so I can sleep more soundly. Do you think society and culture is accepting of people with mental illness? No, society at large doesn’t understand that mental illness is not a character defect. Mental illness is a chemical difference in the brain or a response to an event so shocking to the system that the brain can’t fully process it. Even though mental health is one of the most common physical ailment, surpassing cancer in its scope, it still is considered to be separate from our bodies. How do you feel your Government in your country helps people with mental illness and could they do more? While the United States has the Affordable Care Act, it largely does assist with access to mental health care. There is a severe shortage of beds and psychiatrists. Those shortages mean that even while in crisis, it is possible to wait up to 12 weeks to get care. Even for a person with insurance coverage, accessing and affording mental health care is a financial burden. Have you ever had any creative therapies as part of your treatment, did it help? I have not had mental health providers suggest any kind of creative therapies. I have instead created my own practice. Do you think artistic / creative expression can be used to help people with mental health problems? I believe expression is a huge factor in moving toward stability and resilience. When one is not listened to and validated, creating a safe way to release and explore can be very therapeutic. Do you think artistic / creative expression could help raise awareness and communicate how mental illness affects people? Yes but only if those affected by mental illness are willing to be open and authentic about their challenges and successes. What made you want to get involved with ASLI’s MENTAL ILLNESS, HEALTH AND RECOVERY CAMPAIGN? ASLI’s mission speaks to me because mental illness can be very lonely, stigmatizing and scary. Through education and advocacy, change is able to occur. Do you believe in more rights for mentally ill people in the workplace and for equal opportunities? Yes. With the proper supports, those with mental illness are able to perform as well as those without mental illnesses and should have the opportunity to do so. We at ASLI want to de-stigmatize diagnosis labels within mental illness so that people treat others and their own mental health label as that of a diabetic or any other chronic “physical” illness, as we know the brain is physical and this would further improve stigma and marginalising mental illness. How do you feel about diagnosis labels? I believe that diagnostic labels are a way for those with mental differences to better understand and manage their conditions. Integrated, holistic health care approaches can help with this. We’ve come a long way but there is still the unfortunate perception that mental illnesses are not a “physical” illness and are therefore a weakness. We can change that perception with openness, honesty and awareness. Everyone within ASLI is affected in some way by mental illness, with our MD having several chronic mental illnesses and other members either caring for or dealing with mental health issues. Would this make you think twice about working with ASLI? And does this make ASLI “less professional” in your opinion and if so why? An environment of shared lived experience contributes to a supportive way of being. This does not make ASLI less professional. Rather, it ensures a supportive and well-informed organization doing the work of education and advocacy. Are there any artists/creatives/performers which you admire, who suffer from mental illness that you feel use their work to discuss or highlight mental health? I greatly admire Jennifer Pastiloff, Melody Ross , Demi Lovato and Ashley Johns from Fierce Forward, all of whom speak openly about depression, its challenges and have learned to thrive in spite of mental illness. It is the courage and authenticity of those willing to take off the mask that provides hope for others to do the same. Finally is there anything else you would like to tell us about yourself or your experiences? The most important blessing for me in being a person with a mental health difference came while I was suicidal. I fought for myself for eight weeks before gaining access to care. I was in crisis, working a full time job and using every spare moment to network with my peer group, call services and advocate for myself. As a survivor of abuse, that experience taught me how much I love myself because I literally had to fight for my life and I survived. I now know that I can survive a crisis and navigate through it – that I have the skill set to do so and can share those skills with others.